MK Dons' dismal run continued on Saturday as they were soundly beaten 3-1 at Stadium MK by Swindon Town. As the discontent continues to grow in 2019, Swindon were comfortably the better side in the opening 45 minutes, with Michael Doughty rolling home a well-deserved opener after 34 minutes. A more spirited start to the second period saw Dons find a semblance of a groove, with Jake Hesketh scoring a wonderful effort on the hour to pull level. But within a minute, Swindon were back in front thanks to a Keshi Anderson rocket. And 11 minutes later, Doughty made sure from the penalty spot when Russell Martin downed Kaiyne Woolery. Kieran Agard's goal with two minutes to go gave Dons a slim lifeline but the result sees Dons drop out of the play-offs for the first time since September. After their fourth defeat in five last time out, Paul Tisdale handed his first start to Jake Hesketh after he arrived on loan from Southampton, with Kieran Agard also returning to the side after dropping to the bench at Exeter. Ryan Harley and David Wheeler dropped to the bench. But it was a nervous start from the home side. Swindon, undefeated away from home in their last four, were in the ascendency in the opening half hour, winning a string of corners as Dons could barely get hold of the ball. When they did, it was cheaply given back to the Robins. Their best fell to Theo Robinson but he headed wide from inside the six yard box. They would not have to wait long for the opener though, and it came from yet another defensive horror-show. Gifted the ball in the centre of the park, Michael Doughty, who had already shown signs of fancying his chances from range, was allowed to run 10 yards unopposed by the retreating back-line before simply passing the ball from the edge of the box past Lee Nicholls, who did not move as the ball trickled in. 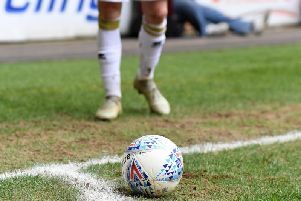 Dons' seeming inability to carve a chance was epitomised when Chuks Aneke fell as he tried to head on goal, but was then hit by Alex Gilbey's strike as he lay on the ground. It was a rejuvenated Dons who emerged for the second half, which awoke the home fans from their first half slumber. Suddenly looking a threat going forwards, Gilbey and Aneke both had good chances to restore parity, which eventually came thanks to a wonderful strike from Hesketh. Picking up Ryan Watson's outside-of-the-boot pass, the man on loan from Southampton exchanged a quick pass with Agard before bending the ball past Lawrence Vigouroux on the hour. But they would be level for barely a minute as Swindon retook the lead, courtesy of a rocket from Keshi Anderson, who took the ball down 20 yards out before lashing it into the top corner. Dons misery was compounded 11 minutes later when Russell Martin's mistimed challenge on Kaiyne Woolery earned the visitors a penalty, which was duly dispatched by Doughty. With two minutes to go though, Dons were given a lifeline when David Wheeler lifted the ball to Agard, who fired home from six yards, but it came too late to change the tide.